Sometimes JPG is the optimal image format to choose, because it’s just easier to work with. Other times image quality prevails over size and in this case a lossless format like PNG or TIFF is the preferred alternative. Regardless of the format, there are numerous Windows tools you can use in order to make the desired transition in an easy and quick manner. In this article we’ve created a list of 10 such programs designed to help you convert efficiently to and from any image format. 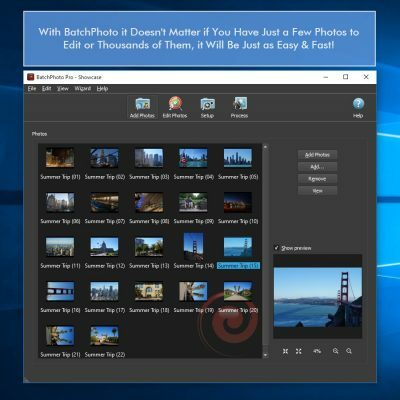 BatchPhoto is an image converter software for Windows developed to handle batch processing. 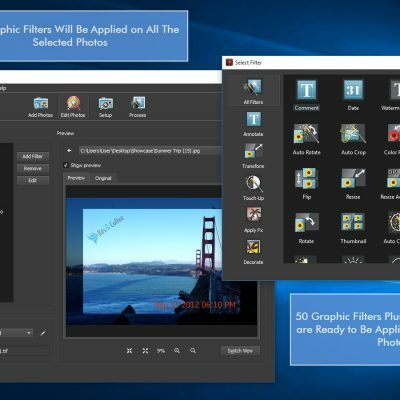 This app has the ability to read and convert to over 170 formats, including RAW files. Whether you’ve used your DSLR to shoot in Sony’s ARW, Canon’s CR2 or Nikon’s NEF format, BatchPhoto can easily ensure the conversion to a more common format, such as JPG. 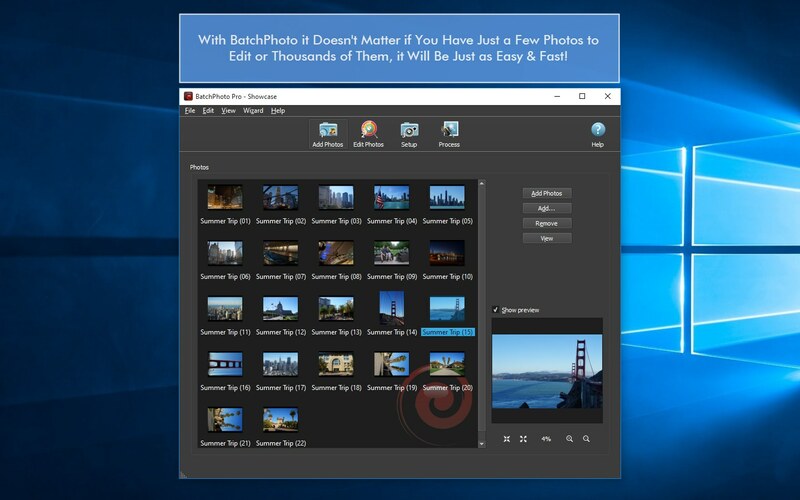 BatchPhoto is quite easy to use and allows you to perform numerous other edits as well, to further optimize your pictures. Depending on your needs, you can resize your photos, crop and rotate them, enhance them with a date and time stamp or protect them by adding a text or logo watermark. You can retouch your images by adjusting the contrast, brightness or saturation and can even apply artistic filters to them. A truly useful feature is the option to save your current settings as Profiles and use them again later. This way you don’t have to carry out the same operations over and over again, just load your profiles and let the program automatically apply your predefined edits. When you’re done you have the possibility to save your newly-edited pictures on a local folder, upload them to Facebook, Flickr or FTP or send them via email. 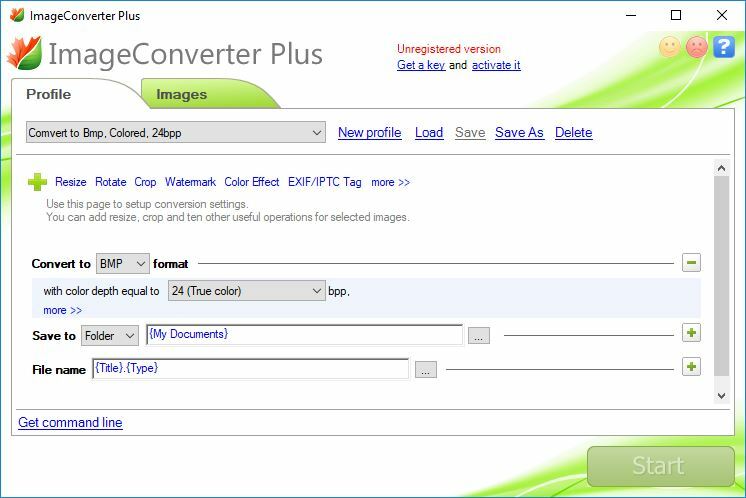 Image Converter Plus is without a doubt a solution worth considering, since it is able to support more than 260 graphical formats, including numerous RAW formats. The tool is designed to help you save time and energy by allowing you to create profiles and easily load them in another session, without repeating the same conversion steps. You can create your own profiles or choose from several built-in ones. With Image Converter Plus you can do more than convert photos. The tool allows you to reduce the size of your pictures, crop out unwanted parts, watermark them or enhance them by reducing the noise or changing the contrast or brightness. When you’re done editing, you can opt to save the new images on your PC, upload them to FTP or send them via email. 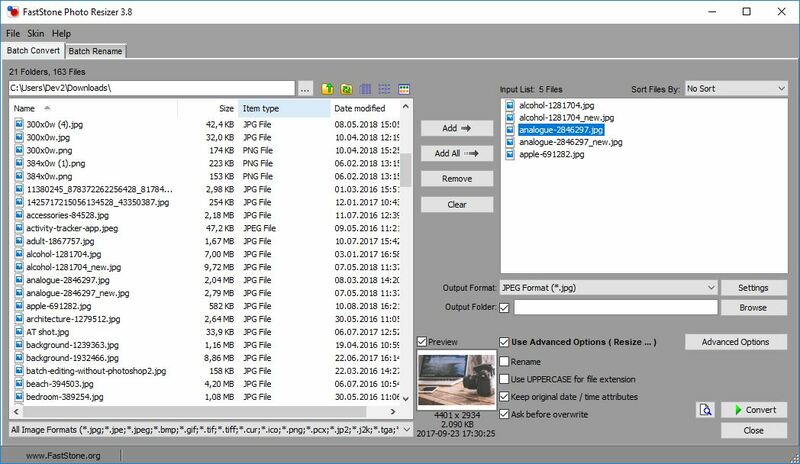 reaConverter has the ability to read more than 600 file formats (it’s worth mentioning that the software counts JPG and JPEG as two different formats), including regular, advanced and RAW image formats. This Windows app comes with a straightforward interface that helps you quickly familiarize yourself with how it functions. All you have to do is add your files, apply the desired image edits and select your saving options. In terms of editing, reaConverter is quite rich in features. You can resize your images, mirror or split them in several parts, automatically crop and rotate them, perform various color adjustments, apply artistic effects or add a watermark. 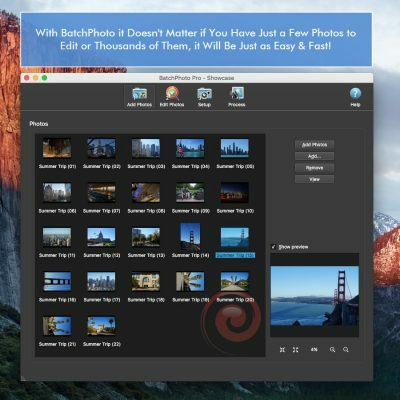 Just like BatchPhoto, the tool comes with a Watch Folders feature that applies automatically preset edits to a selected folder. The saving options allow you to use a local folder or directly upload your edited pictures to Dropbox or Google Drive. 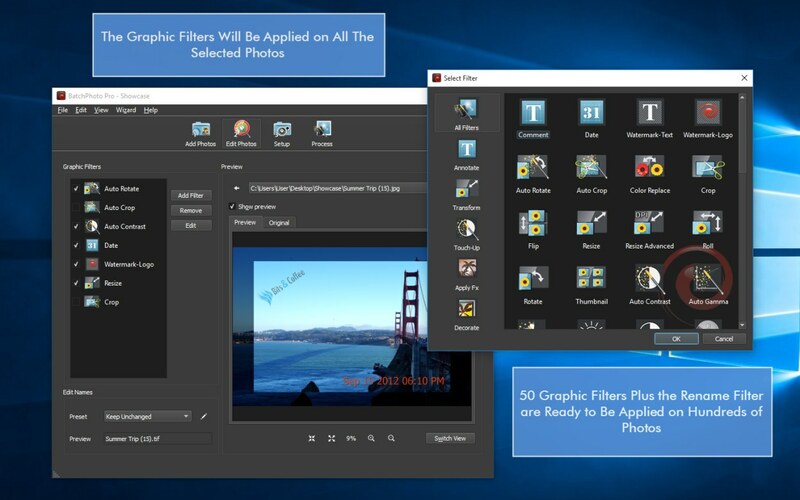 PearlMountain Image Converter is another easy-to-use Windows program for photo conversion. The tool supports multiple formats and has an user-friendly interface that speeds up the entire process. All you have to do is add your images, choose your format and destination folder and let the program batch process your files. If you want to apply other edits to your pictures, you can rely on Image Converter to help you resize, crop and watermark them, as well as make color corrections or add borders. To make your job even easier, the tool allows you to save your current settings as profiles and simply load them in another session. There is also available a series of predefined profiles created to automatically optimize photos for diverse devices and platforms: email, Android and iPhone phones, Facebook and more. AVS Image Converter is designed to ensure a fast conversion between the most widely-known image formats. 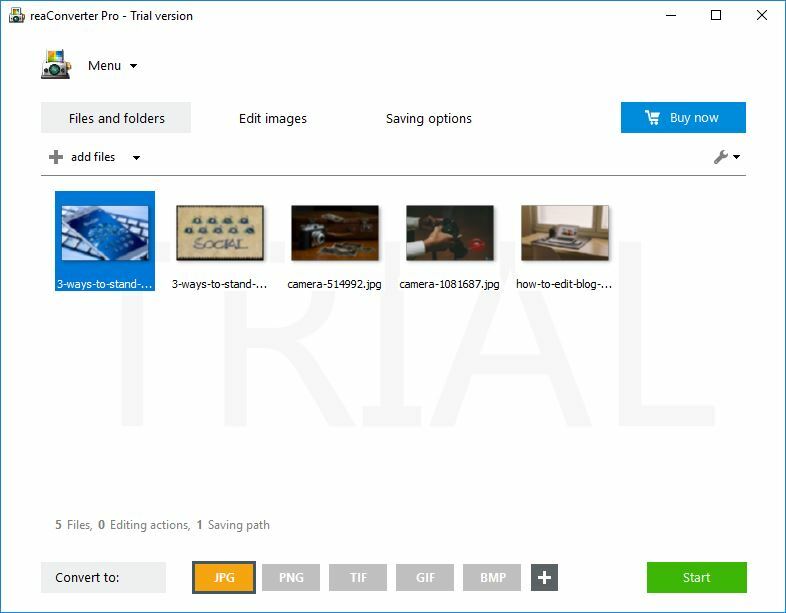 There’s a also a support for certain RAW files, but not as extensive as you’ll find with other Windows photo converters. The interface is intuitive and allows you to get a clear picture from the start of how everything works. There are three main tabs in the left side of the screen: Conversion, Corrections and Watermark. In the first tab you select your output format and whether you’d like to resize and rename your photos. The second tab lets you make corrections to your images and enhance them with special effects, while the third one enables you to add a customizable logo or text mark. 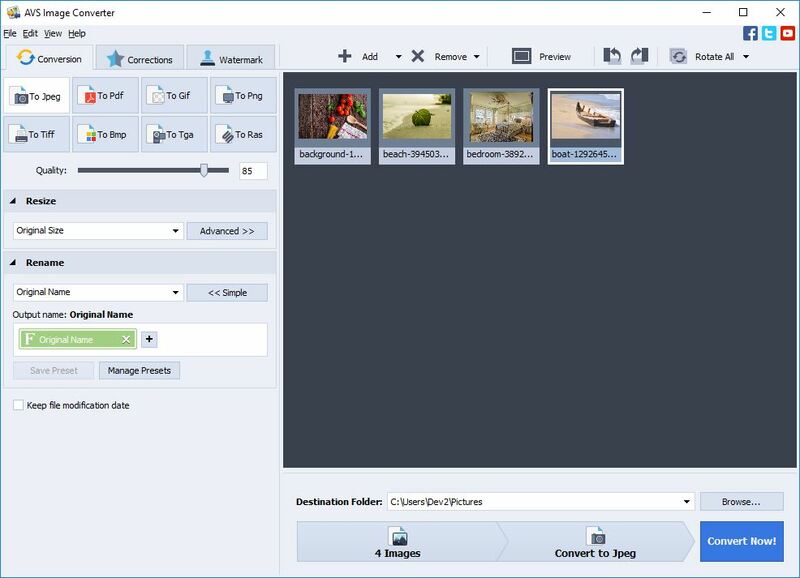 If you’re searching for a simple solution to quickly change image formats, Pixillion Image Converter is waiting for you. 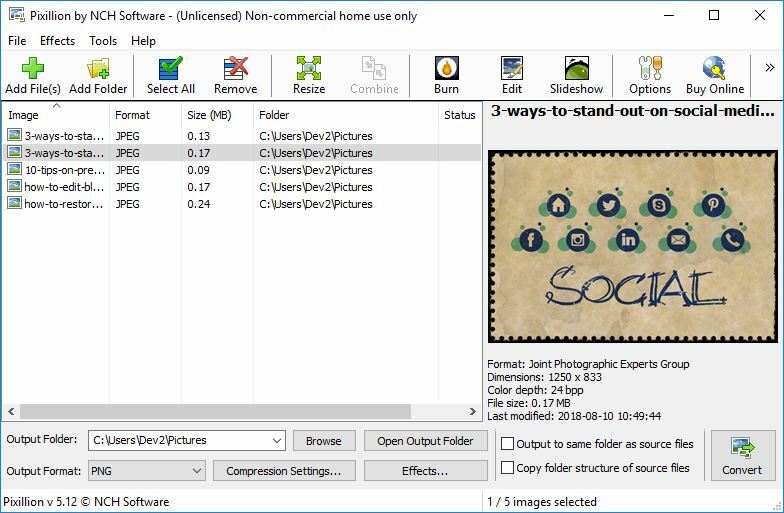 This tool promises to ensure a fast image conversion by following three simple steps: add your files, select your output format and folder and just hit the Convert button. Of course, Pixillion Image Converter allows you to perform other operations, if necessary. You can resize, flip and rotate pictures, as well as add text and logo marks for protection or branding reasons. There are no direct options to retouch your pictures. In order to do that you need to install its sister app PhotoPad. With support for over 90 formats, Able Batch Image Converter does exactly what it says. 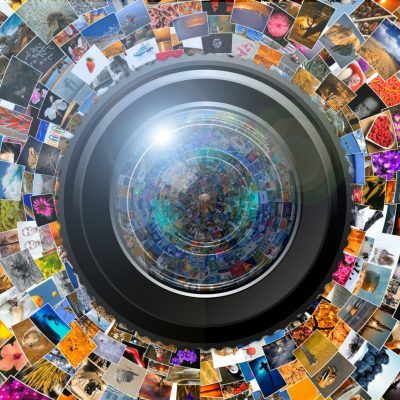 It can effectively convert multiple photos at once with just a couple of clicks. The tool is simply designed so that you can easily accomplish your tasks: add your pictures in the Files tab, apply the necessary edits in the Actions tab and choose your output format and folder in the last step. 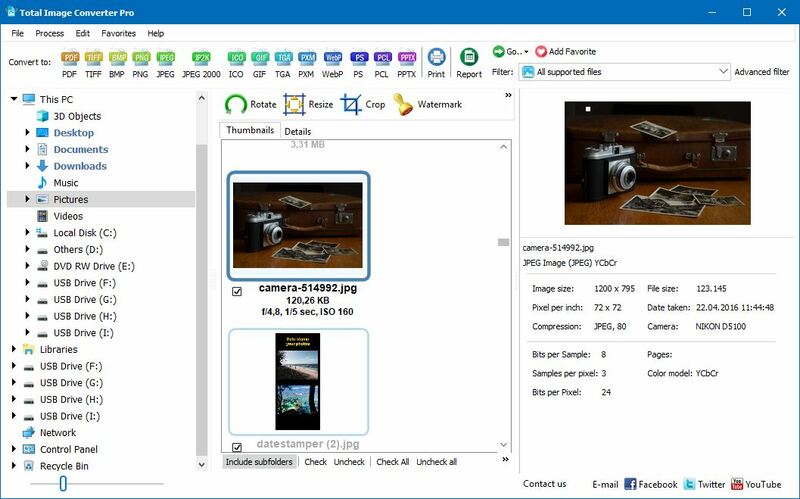 Able Batch Image Converter offers you the opportunity to apply numerous edits to your photos. You get to optimize them for web use by resizing, rotating, cropping or watermarking them. You can also touch them up by automatically correcting the white balance, removing noise, sharpening or adjusting the luminosity. The tool gives you the possibility to save the actions applied and load them in another session. Total Image Converter provides support for 30+ image formats, including several RAW ones. There’s nothing really confusing about the main dashboard. Once you add your files, you just click on the desired format and, in the new dialogue box, simply select the destination folder for your output pictures. Along with converting images, you can resize, crop, rotate and protect them from theft by inserting a logo or text watermark. It’s worth mentioning that the Pro version of Total Image Converter offers support for extra large TIFF files that can reach sizes of 500 MB. 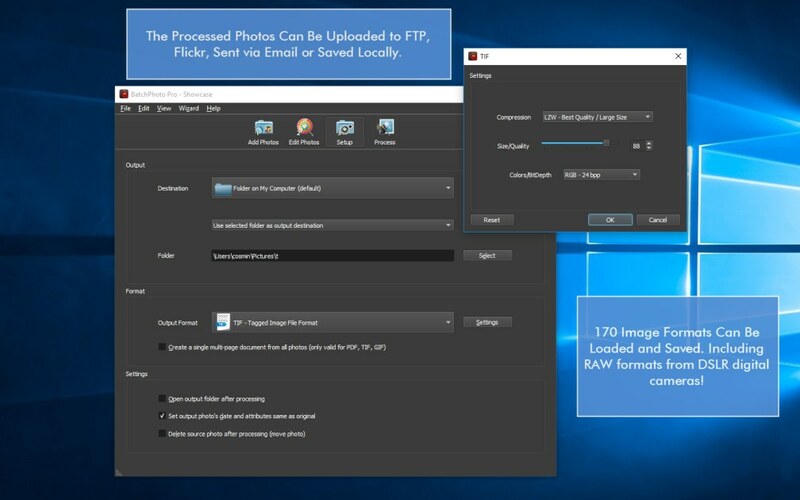 Light Image Resizer provides support for common image formats and can also read several RAW files from popular DSLR manufacturers. The tool comes packed with numerous preset profiles to optimize pictures for email, forums, Instagram, Facebook timeline cover, iPhone and many more. 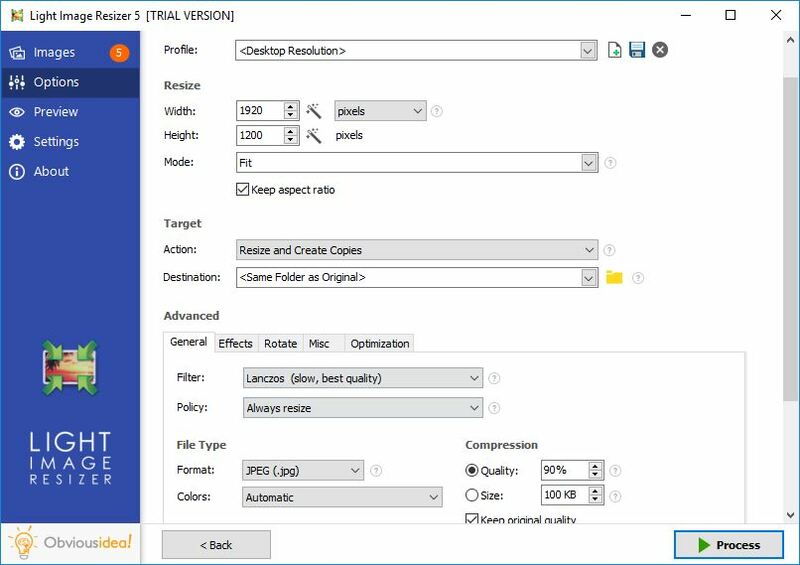 Besides converting photos in bulk, Light Image Resizer allows you to apply various resizing filters for compression quality or speed and to add watermarks. You can perform multiple adjustments to your images, like improving the brightness and contrast, as well as create a photo collage for print use or social networks. FastStone Photo Resizer is a simple Windows tool that, among others, enables you to change between photo formats. Of course, because it’s not particularly designed for photo conversion, it doesn’t support special formats, rather common ones like JPG, PNG, BMP or TIFF. 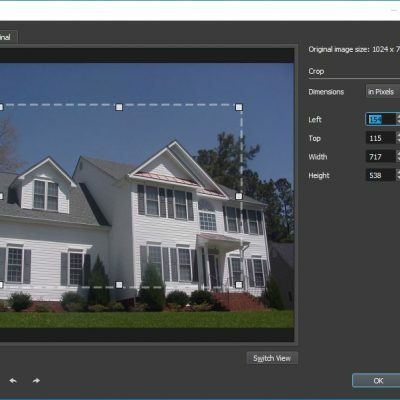 Besides converting you can further edit your images by reducing their size, rotating and cropping them, changing color depth, as well as adjusting the contrast, brightness or saturation. You can also add text comments, watermarks and borders to your pictures.